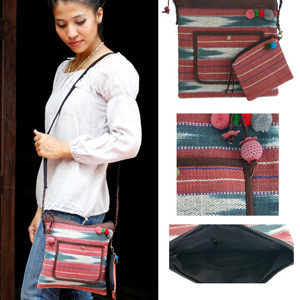 The Karen tribal artistry comes to life in this charming shoulder bag. Handcrafted by bags artisan Chirada Loetparisanyu with leather and Karen's cotton fabric, the front side features pompoms and a pocket that closes with a snap button. 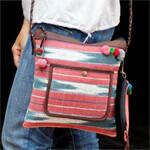 Lined with cotton, the interior hides three inner pockets, one of them zipped to hold small items secure. The small zipped purse can be removed and placed in the inside when needed. The bag itself closes with a zipper, whose pull is decorated with leather flowers and a knitted ball.